The creation of a new welfare model implies the involvement of different territorial actors who can contribute to answering unmet social needs. Among the main actors on the scene are the for-profit sector enterprises that undoubtedly play or may play a key role. The purpose of this research was to investigate and highlight how the non-State actors – and especially the for profit enterprises – can contribute to the creation of new welfare services. The theoretical point of reference has been shared value. It points out that a new way to pursue economic goals is by focusing on social ones. 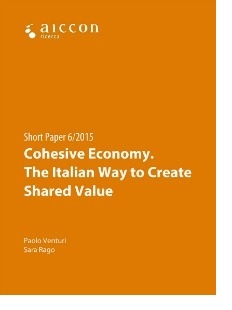 Based on the concept of shared value, the enterprise puts in place strategies, technologies and processes to systematically involve all actors within its ecosystem (employees, customers, partners and suppliers) to get the most of the specific shared value. The research took place from June 2013 and September 2014 and 25 case studies have been selected, 12 of them have been analysed and 7 have been chosen to be further investigated and presented in the final report. 1. The first one is the creation of social capital by strong territorial relationships among SMEs and the community. 2. A second one is related to the establishment of a productive chain between social enterprises and for profit firms. 3. The third one concerns Big co-operatives and for profit enterprises involved in the re-use sector of activity or in the re-distribution of goods within the community through the involvement of the non-profit organisations. 4. The final way to create shared value is represented by Corporate Volunteer Programmes.